Create special moments with this Stimulating Twelve Yellow Roses in a Vase with Dreams Of Joy when you are together with your loved ones. 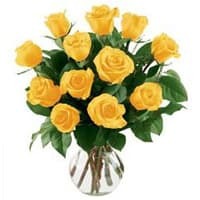 12 Yellow Roses in a Good Quality Vase. and Cadburys Celebration pack. 12 Yellow Roses in a Good Quality Vase. with 500 grms Assorted Sweets. 12 Yellow Roses in a Good Quality Vase. with 16 pcs Ferrero Rocher chocolate box.